Bullying is one of the most serious issues facing educational institutions today. It can lead to school violence, a more negative school climate, and potential legal actions from parents. As a school administrator, you have the opportunity to address school bullying on all levels of a student's experience. By leading your school or district in bullying prevention efforts, you can help create a safer, more positive learning environment. 1. Focus on the social environment of the school. To reduce bullying, it is important to change the climate of the school and the social norms with regard to bullying. It must become "uncool" to bully, "cool" to help out students who are bullied, and normative for staff and students to notice when a child is bullied or left out. This requires the efforts of everyone in the school environment- teachers, administrators, counselors, other non-teaching staff (such as bus drivers, nurses, school resource officers, custodians, cafeteria workers, and school librarians) parents and students. 2. Assess bullying at your school. Adults are not always very good at estimating the nature and extent of bullying at their school. Frequently we are quite surprised by the amount of bullying that students experience, the types of bullying that are most common, or the "hot spots" where bullying happens. As a result, it is often quite useful to assess bullying by administering an anonymous questionnaire to students about bullying. What are the possible benefits of conducting a survey of students? Findings can help motivate adults to take action against bullying. Data can help administrators and other educators tailor a bullying prevention strategy to the particular needs of the school. Data can serve as a baseline from which administrators and other educators can measure their progress in reducing bullying. 3. Garner staff and parent support for bullying prevention. Bullying prevention should not be the sole responsibility of an administrator, counselor, teacher-or any single individual at a school. To be most effective, bullying prevention efforts require buy-in from the majority of the staff and from parents. 4. Form a group to coordinate the school's bullying prevention activities. Bullying prevention efforts seem to work best if they are coordinated by a representative group from the school. This coordinating team (which might include an administrator, a teacher from each grade, a member of the non-teaching staff, a school counselor or other school-based mental health professional, a school nurse, and at least one parent) should meet regularly to digest data from the school survey described in Strategy 2; plan bullying prevention rules, policies, and activities; motivate staff, students, and parents; and ensure that the efforts continue over time. A student advisory group also can be formed to focus on bullying prevention and provide valuable suggestions and feedback to adults. 5. Train your staff in bullying prevention. All administrators, faculty, and staff at your school should be trained in bullying prevention and intervention. In-service training can help staff to better understand the nature of bullying and its effects, how to respond if they observe bullying, and how to work with others at the school to help prevent bullying from occurring. Training should not be available only for teaching staff. Rather, administrators should make an effort to educate all adults in the school environment who interact with students (including counselors, media specialists, school resource officers, nurses, lunchroom and recess aides, bus drivers, parent volunteers, custodians, and cafeteria workers). 6. Establish and enforce school rules and policies related to bullying. Although many school behavior codes implicitly forbid bullying, many codes do not use the term or make explicit our expectations for student behavior. It is important to make clear that the school expects them to be good citizens, not passive bystanders, if they are aware of bullying or students who appear troubled, possibly from bullying. Developing simple, clear rules about bullying can help to ensure that students are aware of adults' expectations that they refrain from bullying and help students who are bullied. School rules and policies should be posted and discussed with students and parents. Appropriate consequences also should be developed for not following the school's rules. 7. Increase adult supervision in hot spots where bullying occurs. Bullying tends to thrive in locations where adults are not present or are not vigilant. Once school personnel have identified hot spots for bullying from the student questionnaires, look for creative ways to increase adults' presence in these locations. 8. Intervene consistently and appropriately in bullying situations. All staff should be able to intervene effectively on the spot to stop bullying (i.e., in the 1-2 minutes that one frequently has to deal with bullying). Designated staff should also hold sensitive follow-up meetings with children who are bullied and (separately) with children who bully. Staff should involve parents of affected students whenever possible. 9. Focus some class time on bullying prevention. 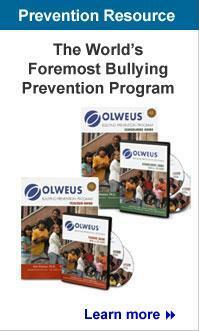 It is important that bullying prevention programs include a classroom component. Teachers (with the support of administrators) should set aside 20-30 minutes each week (or every other week) to discuss bullying and peer relations with students. These meetings help teachers to keep their fingers on the pulse of students' concerns, allow time for candid discussions about bullying and the harm that it can cause, and provide tools for students to address bullying problems. Anti-bullying themes and messages also can be incorporated throughout the school curriculum. 10. Continue these efforts over time. There should be no "end date" for bullying prevention activities. Bullying prevention should be woven into the entire school environment.